Portugal has a liberal economy, which has led to significant development and diversification of the Portuguese market. Non-EU trade partners have continued to maintain their growing importance (27.1 per cent of total exports in 2017 and 25 per cent in the first four months of 2018),3 despite the key role assumed by EU Member States (72.9 per cent in 2017). According to findings by the World Bank, Portugal is the 29th easiest country in the world in which to do business, and 13th within the European Union (a better classification than the Netherlands, France, the Czech Republic or Italy). Also, according to the European Economic Forecast Summer 2018, the growth of Portugal's gross domestic product (GDP) slowed to 2.1 per cent in the first quarter of 2018, mainly because of weaker net exports. Overall, real GDP growth is expected to rise by 2.2 per cent in 2018 and by 2.0 per cent in 2019. According to the World Economic Forum,4 Portugal was ranked 14th in the travel and tourism competitiveness index 2017 and fourth in terms of tourism service infrastructure. Taking into account data from the Bank of Portugal, the net inflow of foreign direct investment registered an amount close to €5.6 billion in 2016 and Portuguese foreign direct investment, in net terms, was close to €1.4 billion in 2016, which corresponds to the highest value during the period 2012–2017. In 2016, the majority of the foreign capital invested in Portugal originated from the European Union, particularly from the Netherlands (with 24.9 per cent of the total), Spain (20.8 per cent), Luxembourg (19 per cent) and the United Kingdom (7.5 per cent). Other than the 28 EU Member States (with a quota of 14.5 per cent of the total), Brazil (2.5 per cent), China (1.7 per cent), Switzerland and the United States (1.6 per cent each) were four of the 10 largest foreign investors in Portugal in June 2017. In April 2016, the Portuguese government initiated a national reform programme for the period 2016–2020. This programme is essential for setting up structural reforms in the Portuguese market, notably by promoting foreign investment and contributing to public finances. The programme is built on qualification, promotion of economic innovation, territorial enhancement, modernisation of the Portuguese state, capitalisation of companies and social cohesion and equality. Moreover, an extensive privatisation programme has been successfully implemented and has provided revenues of around €9 billion, exceeding initial expectations of €5 billion. The programme focused particularly on the aviation, electricity, healthcare and financial sectors. For additional information regarding the programme, see Section VII. Most foreign investment in Portugal is unregulated. Nevertheless, authorisation is required for investment in sensitive areas, in particular defence and other regulated areas such as banking, media and financial services; however, the majority of requirements apply both to national and foreign investors. Foreign investors in Portugal must also take into consideration EU and national competition rules and other EU policies. As a general rule, Portuguese law does not impose any specific restrictions on foreigners or foreign investment in corporate matters. Notably, regulations on the incorporation of companies, mergers and acquisitions, the day-to-day business activities, duties and liability of shareholders and directors, merger control and antitrust apply irrespective of nationality. Notwithstanding the above, some differences in the treatment of Portuguese and foreign entities do exist under Portuguese law (although exceptional), such as the approach taken in connection with groups of companies. The Portuguese framework on corporate groups is based on the central concept of an 'affiliated company', which is deemed to exist upon the occurrence of legally defined types of relationships between companies. Holding companies are legally authorised to direct the management of their subsidiaries if a company is wholly controlled by another company, or a company agrees to subject its management to the direction of another company (which may or may not be its parent company). Holding companies may also issue binding orders to the board of directors of subsidiaries. The orders may be disadvantageous to the controlled company if they serve the corporate group's interests or those of the holding company (despite the existence of specific limits). This potential power is nevertheless counterbalanced by the requirement that the holding company comply with several duties in relation to the subsidiary's financial undertakings. The holding company is liable for all obligations of the subsidiary arising before or after the occurrence of the change in control, and the subsidiary may request that the holding company assume responsibility for its annual losses. Under Portuguese law, the provision of banking services is a regulated activity that may only be carried out professionally by authorised credit institutions or financial companies, and remains subject to the supervisory powers of the regulatory authority of the Member State of origin. Supervision of the Portuguese banking system is governed by the Portuguese Credit Institutions and Financial Companies Legal Framework, approved by Decree-Law 298/92 of 31 December, as amended and the notices, instructions and circulars issued by the Bank of Portugal. The supervision of credit institutions, and in particular their prudent supervision, including monitoring activities carried out abroad, is entrusted to the Bank of Portugal under its basic law enacted by Law 5/98 of 31 January, as amended, and Decree-Law 298/92. Under Portuguese law, insurance services are a regulated activity and may only be carried out professionally by authorised insurance companies and are subject to the supervisory powers of the regulatory authority of the Member State of origin. Supervision of the Portuguese insurance system is governed pursuant to Decree-Law 94-B/98 of 17 April, as amended, which establishes the legal framework and requirements for taking up and pursuing insurance and reinsurance activities, and the regulations and circulars issued by the Portuguese Insurance and Pension Funds Supervisory Authority (ASF). The supervision of energy production, transport, distribution and trade is regulated by Decree-Law 97/2002 of 12 April, as amended. Article 1 thereof establishes the Energy Sector Regulatory Authority as the domestic regulatory authority for the gas and electricity sectors. The legal framework for the production, transport, distribution and trade of electricity6 is regulated under Decree-Law 29/2006 of 15 February, as amended, which establishes the general grounds for the organisation and functioning of the national electricity system, and under Decree-Law 172/2006 of 23 August, as amended, which specifically regulates the production, transport, distribution and trade of electricity in Portugal. Decree-Law 172/2006 establishes that energy production activities under the ordinary regime are free, subject to the granting of a production licence following a request by the licensing entity. Both the transporting and distribution of electricity will be carried out under a public service concession agreement awarded through a public tender, unless the concession is granted directly to a state-controlled entity. The concession is performed under a public service framework on the basis of its classification as a public utility. Decree-Law 172/2006 states that trade in electricity is free, subject to a licence granted by the licensing entity. The licence must be requested by a company that is registered in an EU Member State. The legal framework governing the telecommunications sector is regulated under Law 5/2004 of 10 February, as amended (the Electronic Communications Law). Pursuant to the Electronic Communications Law, the provision of electronic communications networks or services requires a general authorisation. Companies that intend to offer networks and services of electronic communications must submit a short description to the regulator, ANACOM, of the network or service they wish to initiate, and give notice of the date on which the activity is expected to commence, further submitting any details necessary for their full identification under terms to be defined by ANACOM. Once that notification is made, undertakings may immediately commence the activity, subject to the limitations resulting from the allocation of rights to use frequencies and numbers. The legal framework on television broadcasting is based on the Television Act, which governs access to and the exercise of television activity (Law 27/2007 of 30 July, implementing Council Directive 89/552/EEC – Television without frontiers, as amended). The main regulatory authority for such activity is the Portuguese Regulatory Authority for the Media. The Television Act establishes that channel licences are granted through a public tender, and lays down restrictions regarding minimum capital requirements and the ownership of capital (in particular regarding political associations, trade unions, etc.). Portuguese law does not impose any specific restrictions on foreigners or foreign investments in air transport matters. Most mandatory requirements and procedures are established in Regulation (EC) No. 1008/2008 of the European Parliament and of the Council of 28 September 2008 on common rules for the operation of air services in the Community. For an undertaking to be granted an operating licence by the competent licensing authority (in Portugal, the ANAC, according to Decree-Law 40/2015 of 16 March), EU Member States or nationals of EU Member States must own more than 50 per cent of the undertaking and effectively control it, directly or indirectly, through one or more intermediate undertakings, except as otherwise established in an agreement with a third country to which the European Union is a party. In general, foreign and domestic companies are free to invest in any industry. However, there may be specific requirements when performing activities for the public administration sector, such as winning a bid for a concession contract. exploitation of natural resources of the subsoil or that may be considered part of the public domain. Likewise, foreign investment projects must be compatible with specific legal requirements if they could in any way potentially affect public policy, or safety or health matters. Projects of this nature require an assessment of compliance with statutory requirements and preconditions established under Portuguese law. Included in this category are activities concerning the production of weapons, munitions and war materials, or those that involve the exercise of public authority. Such activities must comply with legally mandatory conditions and requirements, and thus require specific licences. Access conditions and the pursuit of commerce and industry of goods and military technology are regulated by Law 49/2009 of 5 August, namely the conditions of access to trading activities (in addition to the purchase, sale and lease activities of any of its contractual forms, import, export, re-export activities or flows of military goods and technologies, as well as broker-related business) and industry (research, planning, testing, manufacturing, assembly, repair, modification, maintenance and demilitarisation of military goods or technology) of military goods and technologies, as well as military activities themselves, either by enterprises and individuals based in Portugal, or qualified entities in other EU Member States. Non-European investment in national strategic assets – those in connection with the main infrastructures and assets related to defence and national security, or to the basic energy, transportation and communication services – may have to comply with the Strategic Assets Special Framework (Decree-Law 138/2014, of 15 September). The Strategic Assets Special Framework sets out some restrictions that specifically apply to entities from outside the European Union and the European Economic Area (Foreign Investors) that intend to acquire direct or indirect control (Control) over assets in specific sectors of the economy: main infrastructures and assets related to defence, national security, energy, transportation and communication services (Strategic Assets). Within 30 calendar days of the execution date of the relevant agreement (or other legal instrument, as applicable) pursuant to which the foreign investor will directly or indirectly acquire Control over a Strategic Asset, or of the date the transaction became public knowledge, if later, the Sector Minister may open an assessment procedure to determine the risk that the acquisition may pose to national security or the provision of basic services considered fundamental to the country. When the procedure referred to in point (a) is opened, the Foreign Investor is legally obliged to provide all information and documentation requested by the Sector Minister. The Minister in charge of foreign affairs and the Minister in charge of national and homeland security are immediately notified of the opening of the procedure. Within 60 calendar days of delivery by the Foreign Investor of the information or documentation requested by the Sector Minister, the Council of Ministers may oppose completion of the transaction envisaged by the Foreign Investor. If the Council of Ministers opposes completion of the transaction envisaged by the Foreign Investor, the legal instruments underlying the transaction, and any subsequent acts related thereto, including transfer of ownership of the Strategic Asset, are null and void. The decision by the Council of Ministers to oppose completion of the transaction is subject to appeal by the Foreign Investor. In addition to the procedure ex officio described above, which is triggered by the Sector Minister, the foreign investor may, on its own initiative, request confirmation from the Sector Minister that the envisaged transaction will not be opposed by the Council of Ministers. If the request for confirmation is not answered within 30 days, the Strategic Assets Special Framework sets out that tacit confirmation is given. The request for confirmation must be accompanied by a description, by the Foreign Investor, of the terms and conditions of the intended transaction involving the acquisition of Control over the Strategic Asset. conservation of the confidentiality, imposed by law or public contract, of the data obtained during the course of activity by those who control the relevant Strategic Asset and of the technological resources required for management of the relevant Strategic Asset. the relevant transaction alters the function of the relevant Strategic Asset, threatening the permanent availability and operability of the Strategic Asset to comply with its applicable obligations, in particular the functions of public service, in the terms prescribed by law. In view of the prohibition against discrimination based on nationality, when setting up a transactional structure in Portugal, there is no need to involve a domestic partner and there are no specific obligations for foreign investors; the treatment of foreign and domestic investment in Portugal is identical. In addition to enjoying the same conditions and rights as domestic companies, foreign companies are liable for the same taxes and must also satisfy social security payment deadlines. Regarding exchange control and currency regulations, the Treaty on the Function of the European Union establishes the free movement of capital within the European Union and therefore, as a rule, all restrictions on capital movements and payments between EU Member States are prohibited. There are no exchange controls or currency regulations affecting inbound or outbound investment, the repatriation of income, capital or dividends, the holding of currency accounts or the settlement of currency trading transactions. However, there are separate restrictions relating to the provision of funds or dealing with the assets of certain individuals and entities (e.g., entities linked to terrorism and recognised terrorist organisations). Foreign investors typically choose a transaction structure that allows them to directly invest in Portugal. The two most important structures involve the incorporation or acquisition of a subsidiary or the establishment of a branch. The choice between the two options is determined primarily on the basis of commercial reasons, given that the opening and registration costs involved, as well as the tax and accounting duties, are generally similar. A subsidiary is an independent legal entity that may be incorporated under any of the structures established under Portuguese law. The most frequently used structures are limited liability companies and public limited companies. Both limit the shareholders' liability for the company's obligations to the amount invested as share capital. A foreign investor's choice between a limited liability company and a public limited company primarily depends on the simplicity of the corporate and management structure, the investment to be made as share capital and any confidentiality issues surrounding shareholdings in the company. The process of incorporating a company in Portugal was recently amended to simplify the process. A company may be set up by means of a private document signed by the shareholders whose signatures are certified by a notary or a lawyer, unless a more formal instrument is required to transfer the assets brought into the company (in which event a notarial deed must be executed). Registration with the Commercial Registry takes only a few days. Any foreign corporation seeking to carry out activities in Portugal for a period longer than one year must arrange permanent representation in Portugal. If the activity has minimum material substance, that representation may be carried out through a branch. The branch is not deemed an autonomous legal entity and, consequently, the foreign company will be liable for all actions carried out by its local branch. The branch must have a representative with general managerial powers and be registered with the Commercial Registry. Under Portuguese law, a tax identification number is mandatory for both natural and legal persons, whether domestic or foreign, who hold obligations or intend to exercise their rights in relation to the tax authorities pursuant to Decree-Law 14/2013 of 28 January. A tax identification number is obtained by filing specific documentation with the tax authorities regarding residency in the country of origin and, in certain cases, by appointing a representative. No tax issue should arise from a non-Portuguese resident's application for a Portuguese taxpayer number. In particular, obtaining a Portuguese taxpayer number does not imply that the non-resident individual will be taxed in Portugal as a Portuguese resident taxpayer, or that the individuals will be subject to Portuguese income tax as a non-resident on income obtained abroad; they will only be taxed in Portugal on income considered to have been obtained within Portuguese territory, if and when applicable. According to Portuguese law, there are thresholds for notification and review, and special situations regarding the regimes governing banking and other financial institutions, insurance and television broadcasting. Under Portuguese law, any natural or legal person (whether domestic or foreign) who intends to directly or indirectly hold or increase a qualified holding in a Portuguese credit institution must give prior notice to the Bank of Portugal of that intention. A qualified holding in a Portuguese credit institution is any direct or indirect holding (as defined by law) of at least 10 per cent of the share capital or voting rights of the entity in which the stake is held, or a stake that allows the holder to exercise significant influence over the management of that entity. Prior notice must also be given to the Bank of Portugal regarding actions that involve an increase in a qualified holding whenever the proportion of the voting rights or share capital held would reach or exceed any of the statutory limits (10 per cent, 20 per cent, one-third or 50 per cent), or when the credit institution becomes a subsidiary of the acquiring company. If the action involves an increase in a qualified holding to above the 50 per cent limit, the Bank of Portugal shall forward the notification and a proposal for a decision to oppose, or not to oppose, the acquisition to the European Central Bank, at least 10 working days before the expiry of the relevant assessment period. The European Central Bank shall then decide whether to oppose or not to oppose to the acquisition. Actions or events that result in the acquisition or increase of a holding representing at least 5 per cent of the share capital or the voting rights of a credit institution must also be notified to the Bank of Portugal within 15 days of their occurrence. The Bank of Portugal is obliged to inform the party concerned if the holding is to be deemed a qualified holding. The incorporation of a Portuguese credit institution is subject to authorisation granted by the Bank of Portugal. Authorisation will be granted by the Ministry of Finance if the matter involves establishing a branch within Portuguese territory of a credit institution with its registered office located in a non-EU Member State (although that power may be delegated to the Bank of Portugal). Any natural or legal person (whether domestic or foreign) who intends to hold or increase, directly or indirectly (as defined by law), a qualified holding in a Portuguese insurance undertaking must give prior notice to the ASF of its intention. A qualified holding in a Portuguese insurance undertaking is a direct or indirect holding (as defined by law) of at least 10 per cent of the share capital or voting rights of the entity in which a stake is held, or a stake that allows the holder to exercise significant influence over the management of that entity. Prior notice must also be given to the ASF regarding actions that involve an increase in a qualified holding whenever the proportion of the voting rights or share capital held would reach, exceed or fall below any of the thresholds (20 per cent, one-third or 50 per cent), or when the insurance undertaking becomes a subsidiary of the acquiring company. Whenever the proportion of the voting rights or share capital reaches, exceeds or falls below 10 per cent, notice must be provided to the ASF within 15 days of the triggering event. The incorporation of a Portuguese insurance undertaking is subject to the ASF's authorisation. The authorisation covers the entire EU territory. In the event of establishing a branch in Portuguese territory of an insurance undertaking that has a registered office in a non-EU Member State,9 the Ministry of Finance will grant the authorisation (or that power will be delegated to the ASF). An authorised agent must be appointed. a modification occurs in the composition of the members of administration or management, or in the structure of the orientation and supervision of its contents. 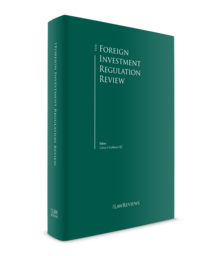 Concerning the protection of foreign investors, arrangements for the reciprocal protection and promotion of investments, which are bilateral instruments containing binding measures to create more favourable conditions for investments by investors of one signatory state in the territory of another, ensure more favourable treatment of investors, and guarantee complete security and protection of investments already made, on a reciprocal basis. Investment in Portugal and the globalisation of the Portuguese economy are supported by a set of tools offered through the National Strategic Reference Framework (QREN) for the next planning period of EU-level economic and social cohesion funds. Incentives are set out in investment agreements with the government in return for making investments and achieving specific contractually stipulated targets. Securing incentives is generally subject to a process of submitting offers in competitive bids, in which projects are evaluated and selected in decreasing order of merit up to a budget limit set in the call for tenders, according to a set of selection criteria and based on a calculation method defined in the call for tenders. Certain projects, in view of their strategic importance (including the size of the investment), may bypass the bidding process. Thus, for example, special-regime projects are exempt from a competitive bid. Special-regime projects may also benefit from a more flexible system for investment-contract negotiations, either in terms of setting goals or, in respect of specific limits, setting the amount and type of incentives to be granted. Any legal or natural person who acquires a direct or indirect holding that, in aggregate or with the shares already held, reaches, exceeds or falls below 2 per cent, 5 per cent, 10 per cent, 15 per cent, 20 per cent, 25 per cent, one-third, 50 per cent, two-thirds or 90 per cent of the voting rights attached to the shares of a public company15 is required to notify the Portuguese Securities Exchange Commission (CMVM) and the issuer of that fact. The 2 per cent, 5 per cent, 15 per cent and 25 per cent thresholds apply only to qualified holdings in public companies that have their shares or other equity securities listed in regulated markets located or operating in Portugal. The Securities Code requires the aggregation of voting rights attached to shares held directly by a shareholder and those held by certain related parties. The shareholder's notification to the CMVM and the issuer must include details of the voting rights held by third parties that have been attributed to that shareholder. Companies operating in Portugal or planning to enter the Portuguese market should take into consideration that the acquisition or merger of companies active in Portugal may be subject to mandatory merger control review by the corresponding competition authorities, and therefore may also be subject to a suspension obligation.16 For that reason, merger control has a very significant role in defining the timetable for an expected transaction and, from a contractual perspective, requires the inclusion of specific provisions regarding the possibility that the transaction may be subject to prior authorisation from the competition authorities. the creation of a joint venture and, in general, the acquisition of joint control over a company if the latter performs all the functions of an autonomous economic entity. From a practical perspective, the competition authorities have considered a wide range of transactions as mergers. Most of these transactions involve acquisitions of stakes or traditional mergers. However, the concept of concentration also applies to other operations, such as the acquisition of assets (e.g., factories, commercial divisions and even intellectual property), including agreements that do not involve a change of ownership. The authorities confirm that the merger control system relies on the concept of 'control'. Only transactions that entail a change in the structure of control of an undertaking will constitute a concentration subject to merger control rules. Nevertheless, the issue must be analysed in each case depending on the market affected by the transaction. If a transaction has an EU dimension, the European Commission will have exclusive jurisdiction over the merger and the Portuguese merger control procedure will in principle not apply. In this regard, the EU Merger Regulation17 establishes the thresholds18 that trigger the obligation to notify before the European Commission. Various acts are criminalised by the Portuguese Criminal Code to prevent corruption in both the public and private sectors. It is important to note that the concepts of 'corruption' and 'bribery' can have different connotations in different countries and are often used interchangeably. For the purposes of this summary, the concept of 'corruption' is used to describe the broader phenomenon of dishonest conduct. As such, it includes the narrower concept of 'bribery', understood as the act of providing (or receiving) an advantage in order to obtain (or perform) a favoured treatment. The Penal Code distinguishes between acts of passive bribery (generally, the act of receiving an advantage in exchange for a certain action) and active bribery (providing an advantage to someone in order to receive favourable treatment) committed in both the public and private sectors. The Legal Framework of Credit Institutions and Financial Companies has been amended by Decree-Law 20/2016 of 20 April, which determined that it is the duty of credit institutions whose by-laws include voting caps, to vote on their maintenance or removal every five years to avoid the relevant voting cap being removed ope legis. In the event that removal of the voting cap is proposed by the board of directors, the relevant resolution of the shareholders' meeting is subject neither to the voting cap nor to special quorum requirements set forth in the by-laws for removal of the voting cap. 100 per cent of CP Carga, the company responsible for the freight and logistics business of national train operator, Comboios de Portugal, to MSC Rail for 53 million. The Portuguese government has launched the procedure for privatisation of the 11 per cent shareholding still held in REN – through Parpública (9.9 per cent) and CGD (1.1 per cent) – which was performed through a direct offer to institutional investors and through which around €80 million were raised. On March 2017, the Bank of Portugal selected Lone Star to complete the sale of Novo Banco. Novo Banco is a Portuguese bank introduced on August 2014 by the Bank of Portugal to rescue the assets and liabilities of Banco Espírito Santo, whose shares are held by a special public resolution fund. Lone Star will inject a total of €1 trillion in Novo Banco, whereby it will hold 75 per cent of the share capital of Novo Banco. The completion of this sale is conditional on the customary regulatory approvals and, subject to acceptance by bondholders, on a liability management exercise to cover the senior bonds of Novo Banco by creating Common Equity Tier 1 capital of at least €500 million. 1 Joaquim Caimoto Duarte is a counsel, Miguel Stokes is senior associate and Hélder Santos Correia is an associate at Uría Menéndez – Proença de Carvalho. 2 The World Bank Group, 'Doing Business 2018: Reforming to Create Jobs', http://www.doingbusiness.org/reports/global-reports/doing-business-2018, p. 187. 3 Source: Agência para o Investimento e Comércio Externo de Portugal, EPE (aicep Portugal Global – Trade and Investment Agency), www.portugalglobal.pt. 4 World Economic Forum, 'The Travel & Tourism Competitiveness Report 2017', http://www3.weforum.org/docs/WEF_TTCR_2017_web_0401.pdf. 5 Nevertheless, the Constitutional Court has already held that the holding company's liability, at least in connection with labour matters, cannot be excluded solely on the basis that its registered office is located abroad. Although these decisions have no general effect (since Portuguese law requires that the Constitutional Court issue at least three decisions to have such an effect), they may trigger a change in the framework. 6 The gas sector is also subject to the supervision of the Energy Sector Regulatory Authority, and the legal framework on the production, transport, distribution and trade of gas is regulated under Decree-Law 30/2006 of 15 February, as amended, which establishes the general grounds for the organisation and functioning of the gas system; and under Decree-Law 140/2006 of 23 August, as amended, which specifically regulates the production, transport, distribution and trade of gas in Portugal. 7 Applicable merger control rules must also be observed. 8 Applicable merger control rules must also be observed. 9 Special rules apply to the establishment in Portugal of a branch of an insurance undertaking that has its registered offices in Switzerland. 10 Similar rules also exist for radio and written press activities. 11 Applicable merger control rules must also be observed. 12 More information about Portugal's Agreements for the Reciprocal Protection and Promotion of Investments can be found at www.portugalglobal.pt/EN/InvestInPortugal/internationalagreements/Paginas/InternationalAgreementsAgreementsfortheReciprocalProtectionandPromotionofInvestments.aspx. 13 Incentive mechanisms promoted by the state should also comply with the applicable EU state aid rules. 14 As previously mentioned, applicable merger control rules must also be observed. 15 Under Portuguese law, the following qualify as public companies: (1) companies incorporated through an initial public offer specifically made to individuals or entities resident or established in Portugal; (2) companies that have publicly offered issued shares or other equity securities to individuals or entities resident or established in Portugal; (3) companies that have issued shares or other equity securities that are or have been listed in a regulated market located or operating in Portugal; (4) companies that have issued shares sold or exchanged, in excess of 10 per cent of their share capital, via a public offer to individuals or entities resident or established in Portugal; and (5) companies incorporated as the result of a split or merger of a public company. 16 Significant fines could be imposed, and even the validity of the agreement challenged, if the suspension obligation is not met. 17 Council Regulation (EC) No. 139/2004 of 20 January 2004 on the control of concentrations between undertakings. 18 A concentration has an EU dimension if the combined aggregate worldwide turnover of all the undertakings concerned is more than €5 billion, and the aggregate EU-wide turnover of each of at least two of the undertakings concerned is more than €250 million, unless each of the undertakings concerned achieves more than two-thirds of their aggregate EU-wide turnover within one and the same Member State. A concentration that does not meet the previous thresholds nevertheless has an EU dimension if: (1) the combined aggregate worldwide turnover of all the undertakings concerned is more than €2.5 billion; (2) in each of at least three Member States, the combined aggregate turnover of all the undertakings concerned is more than €100 million; (3) in each of at least three Member States included for the purpose of point (2), the aggregate turnover of each of at least two of the undertakings concerned is more than €25 million; and (4) the aggregate EU-wide turnover of each of at least two of the undertakings concerned is more than €100 million, unless each of the undertakings concerned achieves more than two-thirds of its aggregate EU-wide turnover within one and the same Member State. 19 Concentrations must be notified to the Portuguese Competition Authority before their implementation if either of the following thresholds is satisfied: turnover threshold – the total combined turnover in Portugal of all the 'undertakings concerned' during the most recently concluded fiscal year exceeds €100 million, to the extent that at least two of those undertakings have turnover above €5 million in Portugal during said fiscal year; market share threshold – the concentration results in the acquisition, creation or increase of a market share in Portugal equal to or greater than 50 per cent; or the concentration results in the acquisition, creation or increase of a market share in Portugal equal to or greater than 30 per cent and less than 50 per cent, provided that the aggregate turnover in Portugal of at least two of the undertakings concerned exceeds €5 million.